The Boonshoft patch for lab coats is available for internal purchase only from the Wright State University Lab Store Catalog, listed as "PATCH, BOONSHOFT SOM/EA. (77490)" on the apparatus page. The item number is 77490, and the cost is $1.83 per patch. In addition to providing business cards and stationery, the university's Printing & Wrightcopy Services (PAWS) preprints several products for the Boonshoft School of Medicine. These items can be ordered electronically through Paper Plus. 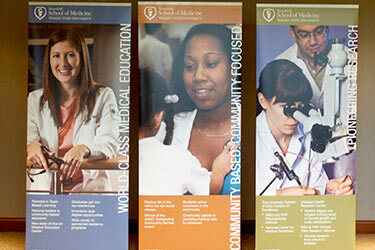 For conferences, meetings or exhibits, the Boonshoft School of Medicine Office of Marketing and Communications lends out its display banners and carrying cases, suitable for shipping by air. The banners are 33.5" x 80" and collapse to a canvas carrying case that's 36" x 4". For table displays, we also have a large table cloth with the school logo. If you would like to reserve the banners or table cloth, contact som_mc@wright.edu or call (937) 245-7610.